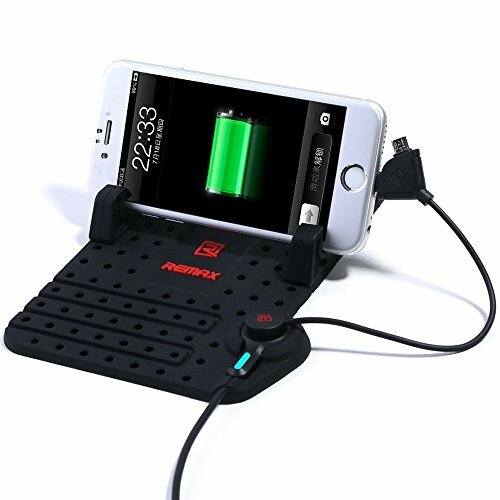 The WIM Car Dashboard Base is a second Generation,provides a convenient,versatile and highly functional cellphone when driving.The holder has a silicone base to allow for stability and no slippages of the holder. Upgrade Second Generation Car Silicone Phone Holder,Improving Core Technology makes your trip more convenience and safe.Upgrade appearance,more fashion! -Hoop type design makes more stable and tight.Deal with perfect when taking a sudden turn,go and down,slam the brakes on,lock-in phone tightly. -Sheetmetals be putted in product,makes slideway and hook more tight. -Anti-reflection design makes navigation more clear. -It makes phone navigation more clear and safe,totally no effect on sunshine. You can lay it on car dashboard for car holder,provide a good view and conveniently when driving. Two mounts that just have to be inserted into the pad dash mat, easy installation to put together.You can lotate your phone in horizontally or vertically. All with silicone gel material,non-magnetic,no adhesive or glue needed. Easy to clean with water if dirty with dust. DIY Disassemble and Combine. Unique design, easily adjusting the width for your iPhone Samsung Galaxy or any size smartphone. Humanized design. Creative Magnetic Absorption Charging Port with Lightning Micro USB 2 in 1 cable. Any time to use your phone when charging. One-hand operation. Super tough and big size design. High quality and multifunction. Also suitable for work and home or anywhere you want it. Super Flexible Silicone Material, adapt to different radian and material, polishing at the bottom to achieve better antiskid effect. Perfect adhere to all kinds of arc center console of all kinds of car and adapt to all sorts of driving conditions. 120 degree Slant Design. Most comfortable angle of view. If you have any questions about this product by WIM, contact us by completing and submitting the form below. If you are looking for a specif part number, please include it with your message.